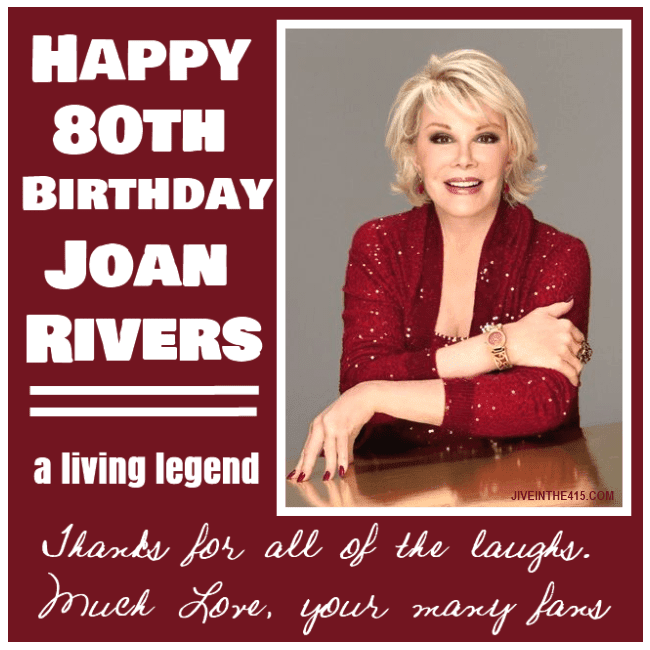 Legendary comedienne and gay icon Joan Rivers is 80 years old today, and I hope that you will join me in wishing her a happy birthday! Joan Rivers has been making people laugh for nearly 50 years! She appears on Fashion Police each week on E!, stars in the reality television show Joan & Melissa: Joan knows Best? on WE tv, designs and sells her jewelry line Joan Rivers Classic Collection on QVC, produces and hosts her new weekly talk show In Bed With Joan, and makes personal appearances across the country, and regularly performs her stand up act on both sides of the Atlantic. She does all of that at 80 years old, and that’s absolutely amazing. There was a huge 80th birthday bash scheduled for last Wednesday night in New York that was sadly cancelled, because Joan’s sister Barbara Waxler, died on Monday. ABC announced this week that Joan will be appearing on Celebrity Wife Swap this summer. She will travel to Alaska to switch places with Bristol Palin, where she will take care of Bristol’s 4 year old son Tripp. Bristol will be entrusted with Joan’s grandson Cooper. In honor of Joan’s birthday, here are some of her most memorable one liners. Elizabeth Taylor has more chins than a Chinese phone book. Can we talk? Happy Birthday Joan! Thanks for the laughs and the memories, and I hope you have a fabulous birthday. We look forward to many more laughs in the years to come!